Refined, redesigned, rebuilt. Is Holden’s new Australian designed and engineered truck a HiLux killer? The Holden Colorado is well known for its solid off-road ability, yet less than stellar comfort and refinement levels. Being invited to the launch of the newest chapter in Holden’s 4X4 utility saga I was hoping to see an update in refinement and quality from the group. Was it going to blow my mind, or was I going to see this model wallow in its own self pity much like the last one? Holden happily handed me the keys to the newest Colorado Z71 to put through its paces to see for myself. Maintaining the tried and tested 2.8L turbo-diesel across the platform, for the most part the engine, drivetrain and suspension of the Colorado has remained relatively unchanged. There have been a few additions and tweaks however – and I got the chance to sit down with Amelinda Watt, the lead program engineer on the Colorado in Australia, and yarn about the changes. She told me after she got finished working as the lead engineer on the VFII SSV Commodore, she was instrumental in adding a helical-style LSD to the rear as an update from the previous version, with a change of body and engine mounts to reduce vibration throughout; and the addition of a ‘Centrifugal Pendulum Absorber’ (CPA) torque converter to the auto – the likes of which are normally only seen in very high-end Euro vehicles. Another major upgrade they’ve done is adding electronically-assisted power steering with a faster rack ratio – giving a much more direct, confident feel; and reducing the lock-to-lock turns. I can personally vouch for the steering feel… flinging it from one side of the blacktop to the other at speed, with solid feedback throughout. Holden has also added a slightly larger front stabiliser bar, and tweaked the spring rates all around. On the engine front, modifications have been made to the noise and vibration characteristics with a one-piece metal timing cover, injector insulators and oil pan insulators. The Holden people have also relocated the twin balance shaft to assist with noise and vibration reduction, which is the inherent issue with inline four-cylinder engines. Otherwise they’ve maintained the DOHC, deep-skirt block; and the VGT Turbo system because, well, it works. From everything I can see in this new model, they’ve maintained the tough 4X4 stature and ability – but made it drive more like an on-road car with all the comforts that go along with it. Just as a side note: Sitting next to Amelinda (who engineered the VFII SSV Redline) on a motorkhana course, being told to give the Colorado hell, was strangely comforting. The interior is where you’ll find the majority of changes to the new model. From a completely redesigned dash, to the 7in and 8in touchscreen displays, the interior is rather comfortable for your average dual-cab ute. The first thing I noticed when I sat in the Colorado was driver’s legroom. Being north of six-and-a-half feet tall, it’s a constant battle finding something I can comfortably drive over long periods without being curled up to fit in the fun seat, and then having to find a can-opener and shovel to get me back out again. I drove the Colorado for five hours over bitumen and State Forest tracks, and afterwards didn’t feel tired or exhausted (as I have in a D-Max and a Navara). The seats are form-fitting, well supported… oh, and did I mention electric? The next thing you notice is the sound of the engine; or should I say, lack thereof. It’s unnervingly quiet in the cab – whether tackling tracks, or doing a buck-ten up the freeway. You just don’t hear the typical common rail diesel rattle we’ve all come to know and love. Amelinda explained that between her team and the GM Brazil team, they’ve spent quite a lot of time bringing across the acoustic controls from performance GM models. This includes thicker glass, enhanced cab sealing, and more robust fixtures of panels and componentry to the chassis and body. The ‘Infotainment’ system they have developed works well, with Apple CarPlay and Android Auto built in. The unfortunate part about the system however is the speakers and internal amp setup. Full disclosure: I’m a bit of an audio snob and appreciate a decent stereo system for the long miles, belting out some really terrible ’90s rock I grew up on. The hassle I found was, with the stereo set to a level that was just shy of beginning to distort, I could easily hear myself sing… which I’d describe as a cross between Cindy Lauper and Marilyn Manson. As I’m sure you can imagine, it ain’t pretty. Tie the audio shortcomings into the fact the fascia panel containing the air-con controls and infotainment system are ‘as one’, and installing an aftermarket head unit is going to be a significant headache. That said, with a decent amplifier with high level input and a set of quality speakers, I think you’d easily drown me out on any lengthy road trip. 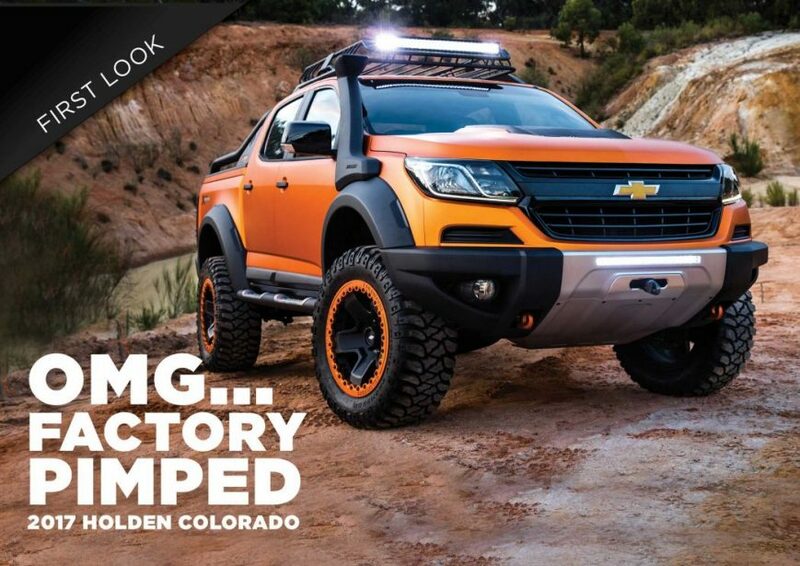 The facelift of the Colorado has certainly grown on me. From the older series looking a little too much like a Great Wall for my liking, it seems they’re following Ford’s styling ideas and taking the looks towards the big American trucks we would all love to get our hands on… if only we had a spare $130K under the mattress. With a fully redesigned front end, featuring Chevrolet’s customary ‘twin port’ grille, you could imagine the Chev bowtie in place of the Holden badge – and not think of the typical bogan VT Chevy-dore. New headlights, front bar and guards hold the rest of the front end together with a lot more style and aesthetically pleasing good looks. Something Holden has really jumped on with the new Colorado are the genuine accessories. Fitting of these at the dealer level ensures they are covered under the factory warranty. Some of the new accessories I got to look at and play with included a three-stage steel bash plate kit, safari bullbar, bolt-on flares, LED lightbars, tube rear bars, tube side steps, and brand-new sports bars. Probably the most boring yet serious part of any new release – the safety specs. Having nailed down a 5-star ANCAP Rating across the whole range, Holden has certainly stepped up to include all of the modern features you’d see in your typical roadgoing sedan. The manufacturer has managed to jam seven airbags into the cab, and it took me a solid 10 minutes to find Number 7. Believe it or not, it’s at your knees – to save them copping a hiding on the steering column in a decent front-ender. The Z71 I got to play around with also has a lane departure warning buzzer, which gets more aggressive the more out of your lane you get (without indicating, I might add); forward parking assist buzzers (think same as reverse sensors); and tyre pressure monitoring. Holden has thrown in everything you’d expect in a Volvo (but without actually being one). Suffice to say you’d feel comfortable throwing your other half and the ferals in the cab without a second thought. Will this truck outsell the HiLux? Probably not, but only due to the innate HiLux love we Aussies seem to have. Is it as good a 4X4 as the HiLux? You bet your arse it is. Considering other new releases across the mid-size 4X4 utility range, Holden has certainly picked up the ball and run with it – whereas a lot of the other manufacturers have left us all feeling a little underwhelmed with their new releases. I’d happily put the Z71 or LTZ up on par with the Ford Ranger Wildtrak as it’s a cheaper truck to buy, and it has more features and standard inclusions. PLUS you’ve got a massive amount of factory accessories you can add as part of your finance package instead of having to look for them elsewhere. You’ve hit the mark Holden… and I’d recommend that anyone looking for a ute in this class should go and have a squiz before you write it off. This article was originally posted by Unsealed 4×4. 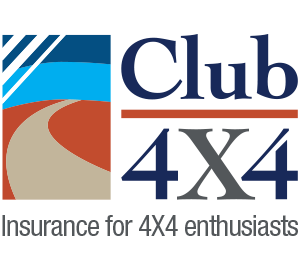 Shane, if the quote you’re after is for insurance, please feel free to give us a call on 1800 CLUB 4X4 – sounds like you’re fairly well modified, so calling us in the way to go.